It’s that time of year that kids love and parents fear: summer vacation! Study after study has shown that kids need unstructured playtime (be that outside exploring or playing with imaginative toys like these). In my household we take a break from extracurricular classes and sports during the summer months and we find ways to make our own fun (for as little money as possible). Self-guided play guarantees that kids are resilient, resourceful, and never, ever bored, but how can you let your kids play freely without finding them still in PJs, eating cereal and watching TV at 5pm? 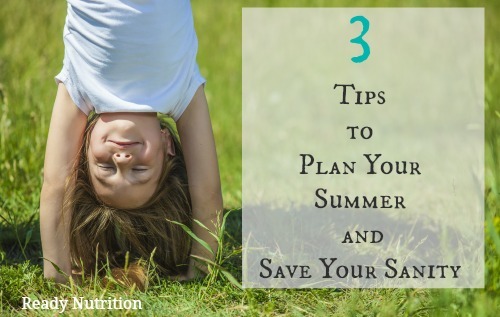 A little planning on the parent-side of things will keep your days running smooth all summer long. Budgeting time is like budgeting money—if you don’t do it, you’ll wind up feeling like you’ve wasted the day without anything to show for it. Creating a schedule you can post somewhere in your home (we have a “base station” where we keep our calendar and other important information) sets the tone for the day. This isn’t meant to be strictly adhered to; instead, this schedule sets intentions for the day. We try to keep our bigger activities to two per day—one in the morning and in the afternoon. Hint: Getting dressed soon after wake up is super important for setting the tone to a fun, productive day. In the case of the Summer Mural Activity, kids gather outdoor materials (shells, sand, leaves, feathers, etc.) from the backyard to add to a seasonal mural that they work on slowly over many days, but you can plan any type of outdoor activity. The point is to get them in the fresh air and guide them into their own play. Hint: having kids collect particular things gives them a goal and will keep them busy and outside longer. They might also be given a directive to look for a specific plant or animal/insect to observe. In this example the main activity would be to add collected materials to the summer mural with glue, but I also make sure to have lots of paper/crayons/paints set up to entice a variety of independent crafts. Hint: We buy butcher paper and spread it over our dining table every morning to keep cleanup easier. I make sure to provide crafts that avoid glitter, beads or other tiny, messy items that require a ton of clean up. Hint: I continue to pack/plan lunches for my kids the night before, even when they’re out of school. It’s so much easier to just hand them their lunch bags instead of planning/preparing in the moment and we can always bring our lunches with us if we decide to stay outside. Hint: set up a few stations at the dining room table to entice kids who have trouble getting started with self-guided play. 2-4:00 Field trip! (rotates between several activities: library, swimming, park, movie in a theatre, farmer’s market, library, museum, etc. Hint: We try to only pay for 1-2 activities per week—the rest are free in our community. Hint: use crockpot recipes while kids are doing their “wake up” routine to have dinner cooking as you’re enjoying your day. I try to cook enough so that I’m heating leftovers every other night. We also stick to simple salads with chicken or salmon to make prep easier. Hint: I’m not opposed, nor do I feel guilty about letting my kids watch a little bit of television at the end of a fun, active day. I think downtime is great and my kids tend to get cranky/whiney in the early evening, so I like to keep them absorbed in something (be it in a book, TV, or helping me make dinner). Do what’s best for your family! Again, this schedule isn’t meant to be confining—you might discover that your kids don’t have the attention span to craft for an hour, or you might find that they’re content to stay outside running around all day. The point is to have a plan you can refer to if necessary. In order to keep the summer machine running smoothly, you need to plan it out well in advance. Have an idea of dates for local day camps, kid’s day at the movies, activities at local restaurants where kids eat free, etc. As well, stock up on crafting supplies, books, games and toys. I like to use trips to the craft store as one of the field trips we take in the afternoons. I let the kids pick out an assortment of things they want to try working with. Try to purchase crafting items that are open-ended and multi-use so you can get the most bang for your buck. Keep the activities age appropriate. If your kiddos like to walk, take them on a small hike, but make sure the hike isn’t too much for them. Pay attention their cues of when they are tired and ready for a break. I try to make the things that can sometimes be a parental drag (grocery shopping, cooking, doing laundry) into activities for the kids. Organizing a trip to the farmer’s market for a field trip serves as an activity as well as a necessary errand. Washing the car can be lots of fun and even emptying the dishwasher can be turned into something exciting for little kids. I want to be clear that I’m not a hyper-organized, helicopter mother by any means. I plan my days out to ensure that my kids have fun but also to make things as easy as possible for me. I think independence is crucial and I also want my kids to see me enjoying my summer right alongside them (whether I’m engaged with them or just reading a book or sipping my coffee while they do their activities). Once the kids are off and running on their own play or crafts, take that time to relax a little and have your own fun.